Okay, maybe not that last part, but he is extremely talented. With an incredible sense of design and keen eye for detail, sculptor Mark Newman has more than a few tricks up his sleeve, and is always ready to bring that extra something special to the table for Court of the Dead. From beautiful women to grotesque monsters, Mark’s talent has been showcased in a multitude of professional pieces. In this interview, the humble sculptor, teacher, and pug-lover gives us insight on his creative process, thoughts on Court of the Dead collection, tips for aspiring artists and more. It’s immediately apparent that your personal work and style has a huge emphasis on traditional sculpture and fine art. Which of the ‘old masters’ do you admire most, or look to for inspiration? How do fine art techniques translate or apply to comic book and commercial sculpture? Share your experience so far working on the all-new Court of the Dead collection? MN: Working with Tom [Gilliland] and the team he’s assembled for his ‘brain child’ has been a delightful challenge. He has conjured up an amazing number of elaborate and twisted characters with morbid motivations. In addition to sculpting, I’ve been given the great opportunity to do some concept work under Tom’s direction, and in collaboration with other illustrators. To balance out some of the dark and creepy themes, we feel it’s really important to bring out the aesthetic beauty and overall appeal of each character in sculpture. Playing off eachother’s talents and strengths has made for some strong designs and great end results. I’m enjoying the Court of the Dead series very much. 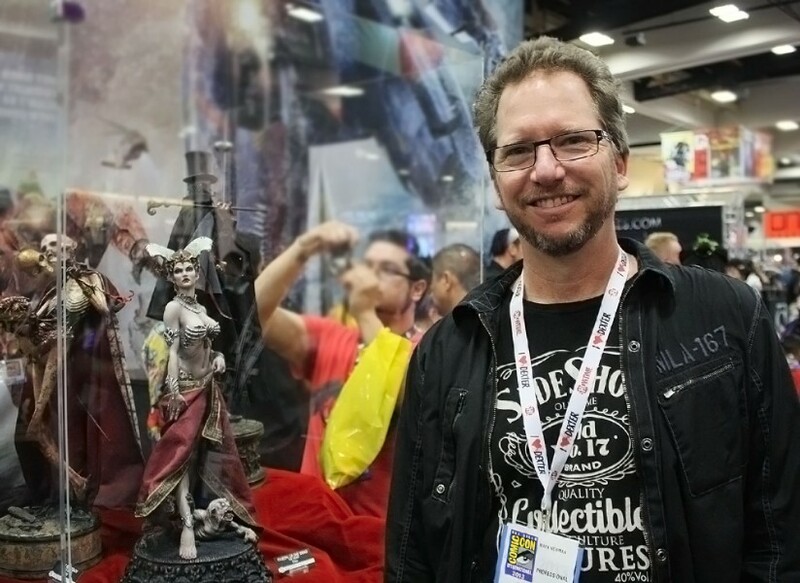 Your work on strong female characters made you the team’s ideal candidate for sculpting the Queen of the Dead. Can you walk us through your process, from armature to finished details? At the start of each project I typically receive character design art. Tom had many artists create supporting art for the Queen, but the primary design chosen to drive the sculpture was provided by the very talented illustrator, Ian MacDonald (below). Can you pass on any advice for aspiring artists, or words or encouragement?